Boosted by strong office and industrial tenant demand, which shows few signs of slowing, Dallas-Fort Worth has captured more than half of the region’s largest trades thus far in 2016, followed by Austin. Hindered by negative national attention from depressed oil prices, Houston and Oklahoma City have seen consistently lower than average trade volumes this year, declining by 60 percent and 75 percent year-over-year, respectively. 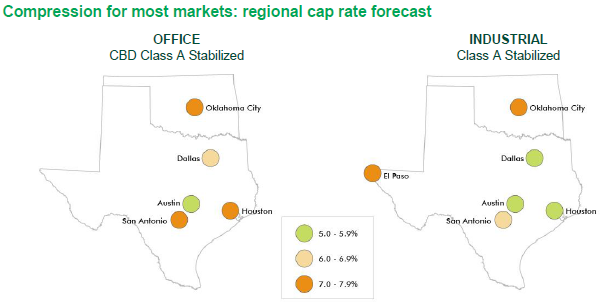 Across the region, retail continues to be one of the strongest product types both in leasing and capital markets. After several years of strong rent growth and an active construction market, multifamily remains an attractive property type for buyers.